There’s no disputing which stallion has made the most impact in Japan’s top races this autumn. For once, it’s not Deep Impact or any other son of Sunday Silence. Instead, it’s a trio of three-year-olds from Harbinger’s third crop that have made the headlines, each winning a Group 1 race at Kyoto. Deirdre set the ball rolling when winning the 2000m Shuka Sho, the autumn leg of the fillies’ triple crown, in October. Third in that race was Mozu Katchan who had Deirdre down the field when winning the 2200m Queen Elizabeth II Cup against older fillies and mares the following month. The pair had earlier made the frame in the Yushun Himba (Oaks), Mozu Katchan again having the upper hand in second with Deirdre fourth. Most recently, Harbinger’s son Persian Knight, beaten a neck in the 2000m Satsuki Sho (2000 Guineas) in the spring, won the Mile Championship, coming from a seemingly impossible position to get up in the last stride. This quick-fire hat-trick of Group 1 wins came out of the blue as Harbinger’s most notable winners previously had been Group 3 scorers, including Beruf and Prophet, successive winners of the 2000m Keisei Hai at Nakayama in 2015 and 2016. Harbinger’s first book of more than 200 mares had some quality as well as quantity as it included the Oka Sho (1000 Guineas) winners Cesario, Dance In The Mood and Daiwa Scarlet, but his three star performers this autumn are out of mares with less exalted records. Deirdre’s dam failed to win from four starts and Mozu Katchan’s dam did not race at all, though Persian Knight’s dam Orient Charm clearly had ability, winning four races and finishing fourth in the Shuka Sho. Deirdre’s great grandam was the high-class miler Sonic Lady, trained by Sir Michael Stoute as was Harbinger. Her wins included the Irish 1000 Guineas, Coronation Stakes, Sussex Stakes and Prix du Moulin. Sonic Lady was by Nureyev who is also the sire of Persian Knight’s grandam Nikiya. Harbinger was leading first-season sire in Japan in 2014, though was helped by having more runners than his rivals (considerably more than most of them). He was then 16th by earnings in 2015, 13th in 2016 and has now broken into the top ten in 2017. Another top-ten sire, incidentally, is Gold Allure, a full brother to Persian Knight’s dam. Harbinger’s career ended with his astonishing eleven-length win in the King George VI & Queen Elizabeth Stakes at Ascot, a sixth win from nine starts. It earned him a Timeform rating of 140 to put up with some of the all-time great middle-distance performers, though injury prevented him from substantiating claims to greatness. A son of Dansili, the mares along the bottom line of Harbinger’s pedigree are by a succession of ‘Derby’ horses of one sort or another; Bering (Prix du Jockey Club), Shareef Dancer (Irish Derby), Connaught (Epsom runner-up) and Crepello (Epsom winner). That solid, rather than flashy, pedigree profile was more likely to make stallion appeal in Japan than Europe. All the more so, since his pedigree makes Harbinger an ideal outcross for the overwhelmingly dominant Sunday Silence bloodline in Japan, so it shouldn’t come as too much of a surprise to learn that Orient Charm is a daughter of Sunday Silence himself, while Deirdre’s dam is by Sunday Silence’s Japan Cup-winning son Special Week. 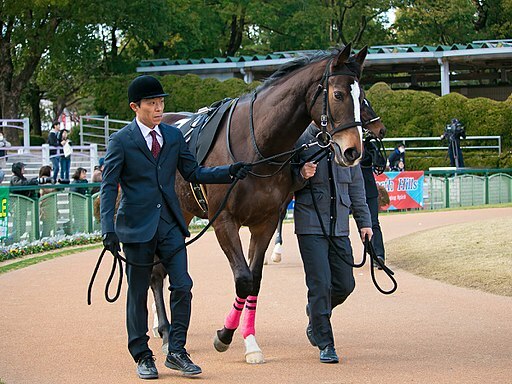 Mozu Katchan has no Sunday Silence in her pedigree, though her dam is by another of Japan’s top stallions, the prime alternative to the Sunday Silence clan King Kamehameha. Writing in the Racing Post, Nancy Sexton quotes figures that reveal that more than half of Harbinger’s 400+ starters in Japan are out of mares from the Sunday Silence sire line, if not Sunday Silence himself. Sexton says that Harbinger ‘has come to cross remarkably well with the Sunday Silence line.’ But is it really that remarkable that he has sired two Group 1 winners from this source when he’s been given more than two hundred opportunities to do so? Just by chance alone, it’s statistically more likely than not that any big winner by Harbinger will have Sunday Silence in the bottom half of his/her pedigree. Incidentally, the three classic winners mentioned above in Harbinger’s first book of mares were all themselves from the Sunday Silence line, though those matings failed to produce winners of note; Cesario is a daughter of Special Week like Deirdre’s dam; Daiwa Scarlet is by another of Sunday Silence’s sons Agnes Tachyon, while Dance In The Mood is a daughter of Sunday Silence himself.